Simply put, run the program, which starts to pick up passwords by brute force. Get login attackers is easy – just look at the commentators and calculate among them administrator. Administrators often do not even bother to change their login and write the name of admin. Since the entrance to the administrative section does not limit the use of multiple connections at once, you can select the password several powerful computers with thousands of generated IP-addresses. 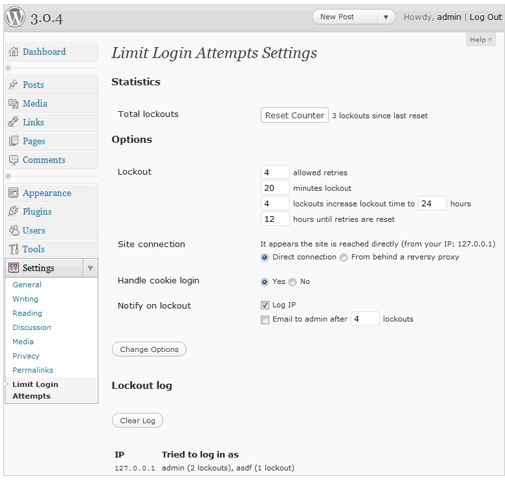 To protect your blog from this type of attack, you can use Limit Login Attempts plugin. What makes the Limit Login Attempts? blocks an Internet address from making further attempts after a specified limit on retries is reached. For example, if you type three consecutive incorrect password, the plugin will try again to enter after a certain period of time, what will give the appropriate sign. After receiving this message, Attackers upset and leave the site, as their task could last indefinitely. In the settings you have all the levers to control and track the intruders.